While the surface of our pale blue dot is almost 71% ocean, accounting for over 96% of the total water of our planet, it only goes so deep. According to the USGS (United States Geological Survey) the total volume of the oceans if contained in a sphere would be around 1,385km in diameter, or 1/10 the size of the Earth. Not very big. The remaining 4% of the Earths water is locked up in the ground, glaciers, and in fresh water lakes and rivers. 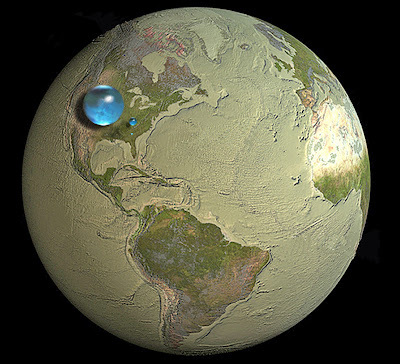 The main image is from the USGS website showing the Earths water in a series of spheres relative to the waterless sphere of the Earth. The tiny sphere hovering over Georgia, US that you can just make out is all of the water that we use everyday in surface water lakes and rivers. 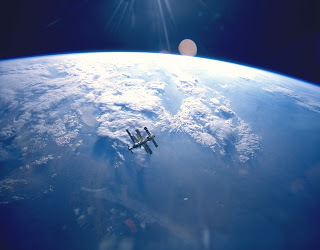 But considering the distinctive voids where ocean once was perhaps we can forgive Arthur C. Clarke for his outside perspective of it all. It is only once we consider the ~6400km of land beneath our feet that we see how meager the contribution of water is to our planet. It is in fact just 0.023% of the total mass. So ocean it may have, but ocean world it is not. 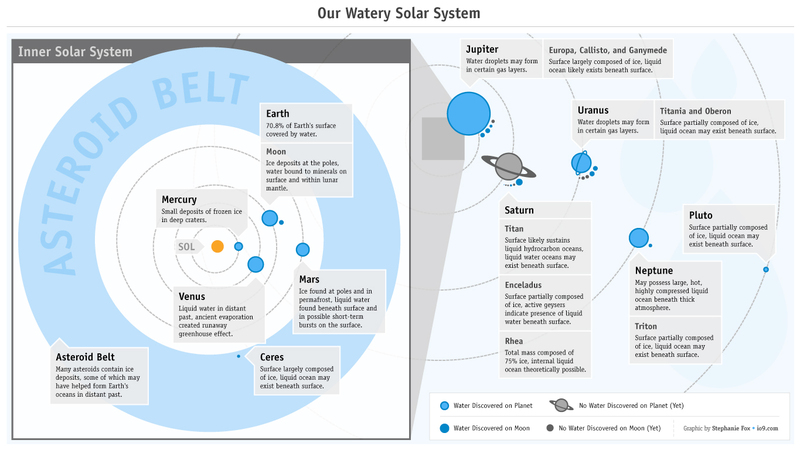 What about the rest of our solar system? Water is an incredibly abundant substance throughout the galaxy and probably the universe so if it is not on the Earth where is it. The gas giants in our solar system are as much as 40% water most of this is in the form of ices. In fact a huge portion of the solar systems water is locked up as ice be that in the shadowy depths of craters on Mercury, the polar caps of mars, or the hurricane force winds of Neptune. The search for liquid water in our solar system takes us 628 million km away to Europa, a moon of Jupiter. Although no direct evidence has been found of liquid oceans beneath the moons frozen exterior it is likely that internal heating and radioactive decay could maintain a body of water beneath the shell of ice. But is water is so abundant what about other solar systems, could exoplanets be covered in liquid oceans? There have been a number of reports over the past few years, of potential ocean covered exoplanets Super Earths with no land mass, but water as far as the eye can see. The first of these was GJ 1214b a planet 2.6 times the radius of the Earth with a mass 6.55 times that of our own planet, giving it a bulk density of 1.87g/cm3, 33% of the Earths. GJ 1214b orbits a small dwarf star 20% the size of our Sun this means that although small the planet makes a large difference in the amount of light we receive as it transits its star. 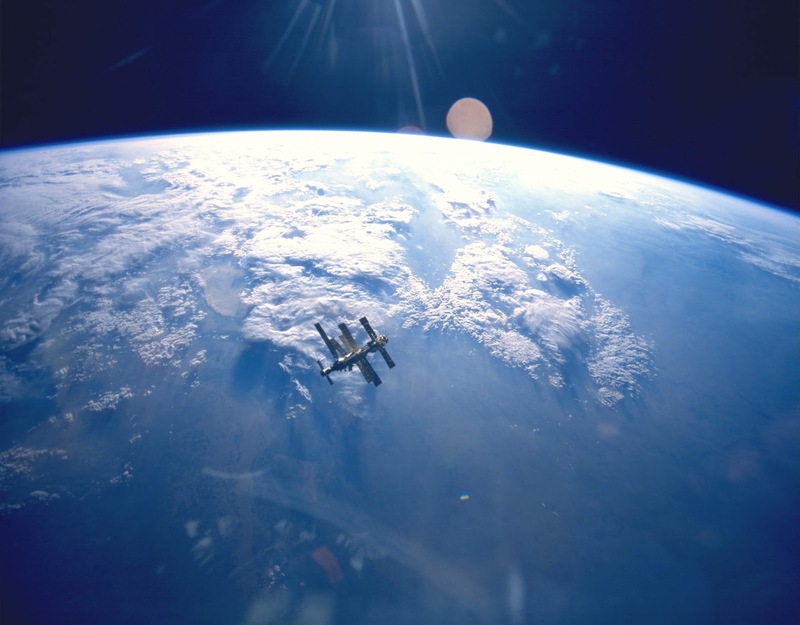 Thus we are able to look at its atmosphere as it transits through transmission spectroscopy – looking for the atmospheric imprint on the planets radius as it transits its star. A number of studies have been done on GJ 1214b with little luck as to defining characteristic absorbers in its atmosphere. Rogers et al (2010) makes an important distinction for this potential ocean world – “an important conclusion from this investigation is that, under most of the conditions we considered, GJ 1214b would not have liquid water.” With an investigation by Berta et al. 2011 showing a flat transmission spectrum and concluding “The high temperatures and high pressures would form exotic materials like ‘hot ice’ or ‘superfluid water’ – substances that are completely alien to our everyday experience.” So don’t pack your dive gear just yet. More recently the NASA Kepler team announced a number of planets Kepler-62e and Kepler -62f as well as Kepler-69b and Kepler-69c as potential ocean worlds. Although there were a number of press releases regarding these discoveries there is little to no evidence to support any strong conclusions as we do not even know the mass of these two planets just the radius relative to the star and the orbital period and distance. Relatively little information when we consider the hidden nature of our own solar system planets when they are right at out fingertips. Follow up observations of exoplanets and our own solar system, with missions like Juno which will reach Jupiter in 2015, will continue to reveal the nature of waters role in our universe as well as opening up many new discoveries for the future. IMAGES: Main image credit: Howard Perlman, USGS; globe illustration by Jack Cook, Woods Hole Oceanographic Institution (©); Adam Nieman.